When Warner introduced the world to classic films like Casablanca and The Adventures of Robin Hood on HD-DVD without following up on Blu-ray, it was worrisome for us Blu-ray adopters, but we felt sooner or later they would come around. And so they did, though much later than we had expected. 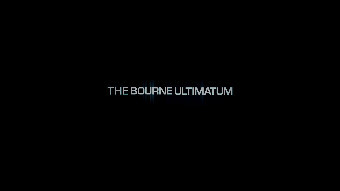 It was different when Universal released the Bourne movies on HD-DVD, because unless Toshiba were to withdraw from the format war, these films, along with Children of Men and Brokeback Mountain, might never see the HD light for us who signed up with Sony. At the time, Blu-ray adopters felt a shudder that their beloved format might be in jeopardy. But once Toshiba threw in the towel and Universal began to put out titles on Blu-ray previously released on HD-DVD a great sigh of relief went out across the planet. We've seen The Incredible Hulk, Serenity, Transformers, and now, in rapid succession, Top Gun, King Kong and The Bourne Trilogy. Considering the importance of this set, I going to make this relatively short: Universal's Blu-ray release is the final nail in the HD-DVD coffin - not just because it is here at last, but because it is much the same, only better. In the interest of full disclosure, I conclude this not because I have compared them (because I haven't - so take my comments with this advisory in mind), but because, even if there were no improvement in image quality, and assuming there are no omissions of Bonus Features, the incorporation of uncompressed audio would be enough to make the Blu-ray a worthwhile upgrade. (HD-DVD's Ultimatum had it, but the first two movies didn't.) I'll say more about the audio in a bit, but for now it is enough to note that thrillers in general, and the Bourne movies in particular (especially the last two), depend on clear and dynamic audio to achieve their mission. As for the Extra Features, there appears to be a minor treat in store for us. Before reporting on my observations as to image and sound, I want to dwell a bit on the importance of the Bourne Trilogy itself. When you think of it, very few cinematic trilogies have achieved a similar level of coherency. Right away, The Godfather comes to mind, which, whatever we may think of the final installment and even though it takes Michael Corleone's story to a logical and dramatically powerful conclusion, it clearly does not measure up to the standards of the first two. More recently Peter Jackson managed the impossible with Lord of the Rings, partly by having been thoroughly worked out as a trilogy – not only in Tolkien's original source books, but in its transition to film and the fact that the three movies were filmed back-to-back even before the first was released theatrically. 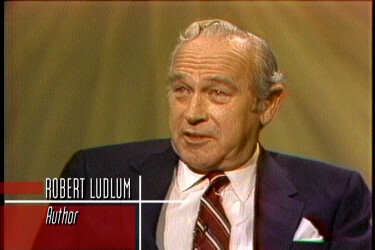 While the Bourne movies share the titles and title character of the Robert Ludlum novels, they do not follow their plots at all closely, which is good news for anyone who hasn't read them – like me and that one other guy in Tuscaloosa. Potentially problematic from the point of view of coherency is that the second and third movies make use of a new director. And while two years have passed in Bourne's life between Identity and Supremacy – the same as out here on the planet – no time separates Supremacy and Ultimatum – though three years have passed out here. Nevertheless, the last two films feel as though the one is the extension of the other, with nary a blink to separate them. 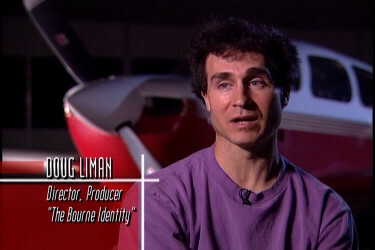 The director for The Bourne Identity, Doug Liman, is actually the entire project's creator and developer. 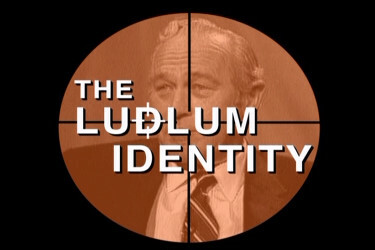 It was he who decided what to retain from Ludlum and what to throw out (viz., most of the plot beyond the basic premise.) 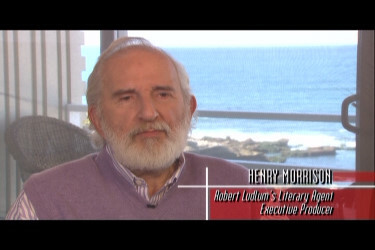 Liman drew upon his own father's memoirs, he having worked for the NSA under Reagan, for the workings of Treadstone. The decision to bring on Paul Greengrass to direct the sequels should not then be viewed as a slap in face for Liman after having done so well with the first movie. Some of the production team remained intact: all three films were written by Tony Gilroy; Oliver Wood, was the DP for all three movies; and John Powell scored them. Chris Rouse worked on Identity, and was the principal editor on Ultimatum, for which he deservedly won the Oscar; Karen Baker was the Sound Editor for all three films (with an Oscar for Ultimatum). Doug Liman (the director for Identity), Frank Marshall (remember him: he produced Raiders of the Lost Ark and a host of other Spielberg films), and Pat Crowley produced the entire trilogy. 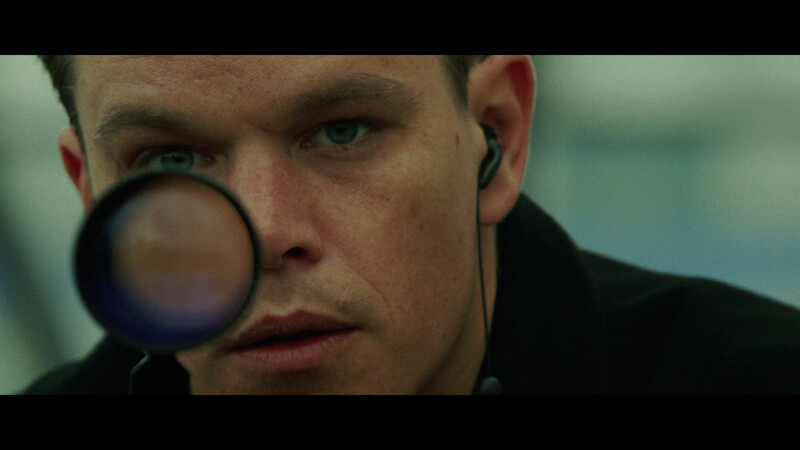 By now, most everyone knows the basic setup for the Bourne movies, so I won't belabor it: Jason Bourne (a perfectly cast Matt Damon) is fished out of the Mediterranean with three bullets in his back and no memory of who he is or how he came to be shot. 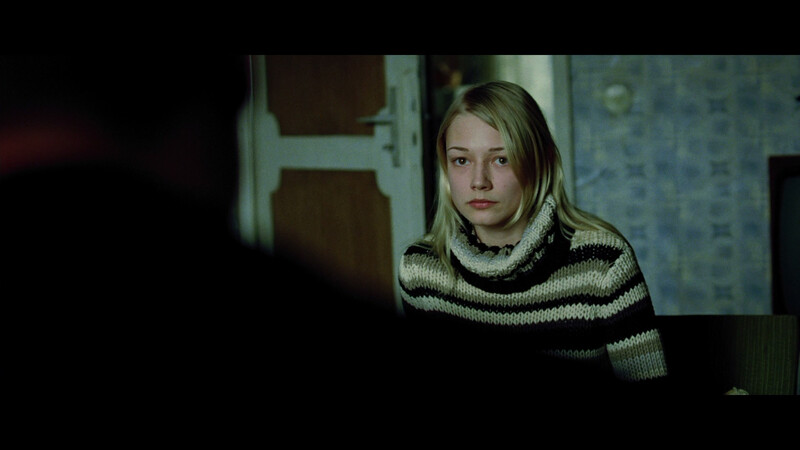 By the end of Identity, and with the help of a civilian, Maria Kreutz (Franka Potente), he is able to piece together parts of the puzzle, though his memory has not yet returned. The movie does not portray our hero as an ill person, but instead uses the amnesia as a device to motivate and propel the story. 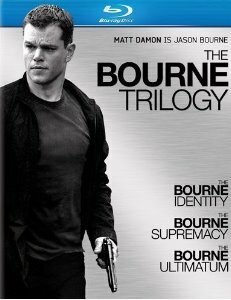 We learn that Bourne was an exceedingly competent assassin for the CIA and that he did not complete his most recent mission, about which his employers (Chris Cooper & Brian Cox) are thoroughly pissed and once it is learned that Bourne is still alive they feel sufficiently threatened to put out a contract on him. 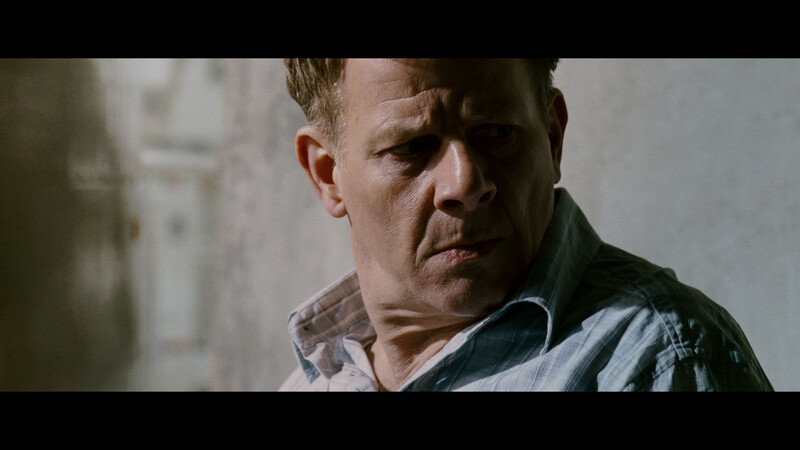 The second two movies reveal an even more insidious operation – codename: Blackbriar – that superceded the one Bourne learned about - codename: Treadstone - and thought he had separated himself from at the end of Identity. The big change from Identity to Supremacy is its reliance on handheld camera and an editing style that sometimes made the movie look like WWII battle footage. I sympathize with the motivation to give the movie a sense of fearful urgency, but I thought then and continue to find such use of the camera a style fetish, like the discovery of the zoom lens in the late 60s and early 70s. By Ultimatum I found that the camerawork and editing style came together, resulting in one of cinema's most exciting set pieces: the chase at Waterloo Station. Which brings me to my final observation about the Bourne Trilogy: Considering that these films are all about running - a series of brilliantly edited cat and mouse chases - it is to their credit that time is taken for the development of character. It was largely the character of Marie – and, to a small, but no less important extent, the Professor (Clive Owen) – that adds layers of humanity to Bourne's identity and those who come into close contact with him. We worry about Marie's future. And if the worst should happen we are concerned that the filmmakers might simply find another female stand-in to fill the function. I am happy to say that between Liman, Gilroy and Greengrass, no such route was employed - yet. So let's take a look at what Universal has given us for their Blu-ray edition: The movies are being offered only as a trilogy for the moment. I think this makes sense. No one movie is so much better than another that you would only want to have the one without the others. And if you are going to get them in high def, you will want this edition. 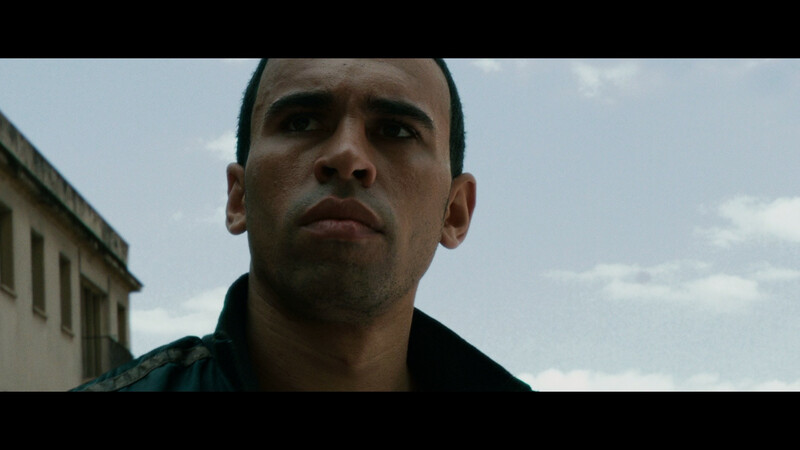 Image: NOTE: The below Blu-ray captures were ripped directly from the Blu-ray disc. In Eddie's review of Identity he commented that the HD-DVD had cleaned up much of the SD-DVD's "small scratches and minor debris" but that some bits remained. Now I'm not nearly as sharp as our once steel-eyed reviewer but I will admit to catching none of these problems on the Blu-ray. Perhaps they're not there or maybe they are submerged in the action. I can only say the Blu-ray for the entire Trilogy seemed spotless to me. The challenge for movies, even ones without heaps of post processing, is distinguishing between the cinematic intention, by which I mean the intent of the director's vision and the cinematographer's art, and the result on video. If we had a fresh theatrical print and a correctly calibrated video system and display, the task would be a whole lot easier, but out here in the real world we don't. It is seductive to complain about the video image because it is dull or grainy or soft, but what if it is supposed to be dull and grainy and soft? Will we remember what we saw in the theatre? And even if we did, will we apply that memory judiciously and without prejudice? It can be a hard call sometimes. So when we compare Identity to Ultimatum and we see how much more dimensional or in sharper focus the image is overall, we are inclined to give the later movie a higher score. But if we saw the original theatrical prints back to back, would we notice that the first movie was in fact more two dimensional? Our experience of Identity in the theatre was probably without complaint in this regard. We accept the reality of the movie as projected and are swept along by the events before us. But video exaggerates the contrast between the key light and the supporting light because the image is smaller and brighter, and everything looks more dimensional, as we call it, than it did in the theatre. In fact, the video experience cannot be the same as the theatrical experience in terms of contrast and brightness – in terms of dimensionality, if you will. So exactly what are we comparing, and how should we score it? When we see that Identity is softer, with less snap and clarity than Ultimatum, do we really think this is the fault of the transfer? Do we conclude that the one negative has deteriorated more than the other; or perhaps that the more recent film has undergone more damage control? I doubt it. Since the same people are responsible for the transfer of the one film as the other, shouldn't we conclude that the difference in image quality between the two movies, or any given scenes within those movies, lies in the photographic and lighting decisions made? 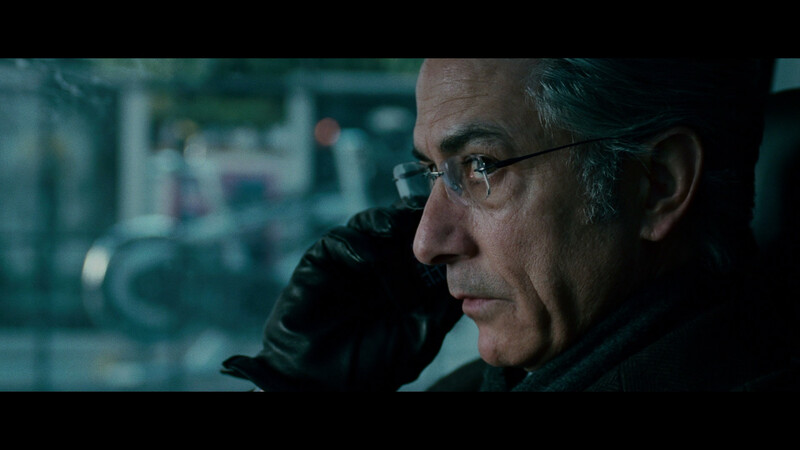 How else do we account for the phenomenal transparency of the U.S. Embassy scene at chapter 6 in Identity compared to just about any other scene in the movie? If it were possible to fiddle with a video file so as to make it appear cleaner and more translucent (in part, this is the DNR argument) should we? 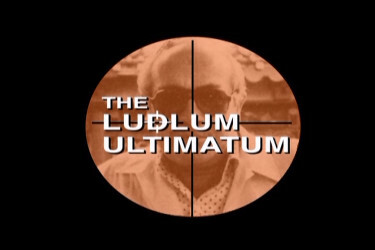 If Identity could be made to look like Ultimatum, should we make it so? Even if it never did? Of course, we can't do anything about focus, which might be shallower on one film than another by design, and has a way of influencing our judgment when someone moves subtly out of focus. So, if we are convinced that the Blu-ray of Identity approximates in a video format the original intent of the filmmakers – whether or not it is as good as it is ever likely to look (and count on it, it isn't) – then how do we score it, especially in comparison to Ultimatum (which will look even better once the video portion of the signal is uncompressed in a format yet to come)? If there is no noise in the shadows or editorial brightening; if there are no halos, edge enhancements, blemishes or artifacts (there must be some we have not yet named or do not perceive) and we believe the video is about what the filmmakers wanted, then ought we not give it a "10"? It's a problem I wrestle with daily and is why I came up with my unwieldy scoring system when I cam eon board at DVDBeaver, but eventually gave it up for its being too complicated. I welcome your thinking on this, but for the time being, I am scoring these Blu-rays as you see, which is my way of copping out of the dilemma. The first number continues to indicate a relative level of excellence compared to other Blu-ray video discs on a ten-point scale. The second number places this image along the full range of DVD and Blu-ray discs. What's a thriller without a dynamic soundtrack to immerse us into the experience, for us to drive through impossible streets and tunnels in one vehicle after another, to be chased on foot across rooftops! There is very little automatic gunfire, so the mix can be that much more precise. We feel all that much credibility to the street action, which is the very definition of mayhem. 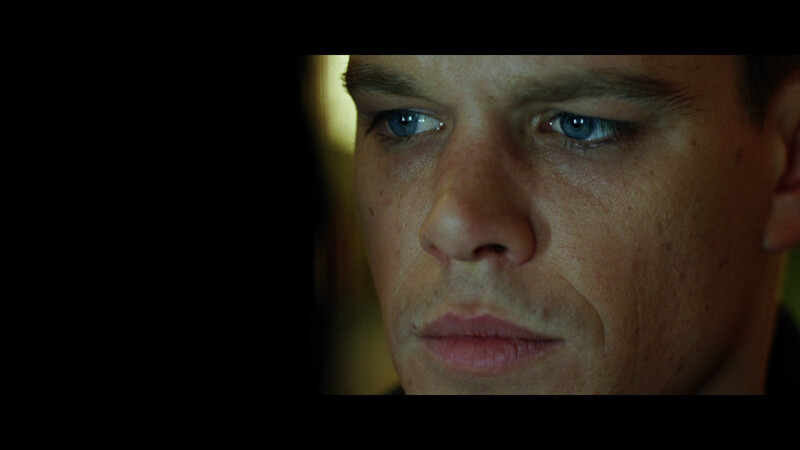 One-on-one fights in rooms (especially awesome is the fight in Bourne's Paris apartment) employ discrete crashes, punches, shots, whatever – again, so that we never become saturated, which would threaten our ability to remain focused with Bourne. We require only a level of confusion to threaten, never overwhelm. The audio mix feels less manipulated, more direct, as the films progress. The largest change is between the first two – the bass on Identity strikes me as having some deliberate distortion in an attempt to create an effect that wasn't originally recorded (I could be wrong), resulting in undesirable thickness. Anyhow my ears ached a little. Not so on the last two movies, whose bass was, if anything louder and punchier. There is more involvement in the surrounds, including the music, with Supremacy, possibly with more in the rear channels, on Ultimatum – in any case, I gave it my highest rating. I felt Powell music became an even more confident part of the soundscape in the final part of the Trilogy, all recomposed and designed by Karen Baker to perfection. I was also especially partial to Moby's new version of Extreme Ways for Ultimatum. The packaging is a study box with a magnetic picture of Jason Bourne that opens to the three movies in unremarkable standard Blu-ray cases. The menu is laid out like other Universal Blu-rays. Arrows tell you which way to direct your remote, and the bonus feature instructions are detailed and intuitive. The chapter menu includes buttons for U-Control in case you want to approach those functions from that point. And, there are the usual number of U-Control opportunities to invite and delight. 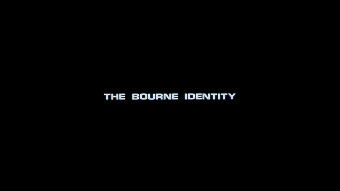 I got such a kick out of the way U-Control's Bourne Orientation functioned, I wanted give this Blu-ray my highest rating. OK, this is where I expected things to get a little dicey. Not having the HD-DVD set to compare directly, I relied on my having researched past reviews of other commentators and, as near as I can tell, just about everything that was there is here now, though one or two items appear to have been renamed. I say "just about everything" – I couldn't locate "The Speed of Sound" sound effects featurette on Identity. "Things That Go Boom" from Supremacy is renamed "Blowing Things Up" on the Blu-ray. 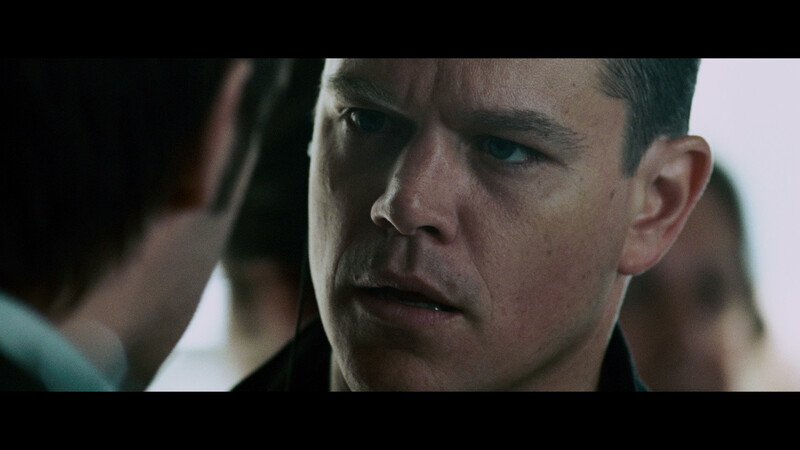 That said and, I hope, done, there is something in U-Control that seems to have had no prior life on video: a feature called "Bourne Orientation" (described as "Bourne Reminders" on promotional literature and press releases). These segments (about 70 seconds per) fill the frame with details, explanations and narrative connections you might have missed. Two video panels play material from the movie – one that continues the story where you left off, the other with related scenes. When you return to the movie, which it does automatically when the segment is finished, it picks up where you left off before the Orientation began. And, of course, there's BD-Live, always ready to connect you and your buddies to big Net in CyberSpace. It is here you should also find the "Bourne Card Strategy Challenge." The Bourne movies are not without their faults, which I choose to ignore for the purposes of this review. Suffice to say that while none of these movies would rate a score of 9, I can't think of an action thriller of the past couple of decades – and certainly not a collection of three – that offers a more satisfying experience in the genre. OK, perhaps Daniel Craig's Casino Royale. (I don't count Hong Kong gangster movies in this category, the best of which do rate higher than the Bourne movies.) But with what has to be the best home theatre experience that The Bourne Trilogy has ever seen, Universal's Blu-ray box set strikes me as a no-brainer.